Irish Place Names by Deirdre and Laurence Flanagan relates the name of the nearby village of Kesh to a wicker causeway, presumably with the name then being transferred to the village and the hill. However, ceis meaning causeway has a short vowel, wheareas this name is Céis with a long vowel. Furthermore, there seems to be no historical or archaeological evidence for such a causeway, and given that the bedrock in this area is porous limestone, which generally creates a very dry landscape, it is doubtful that a wicker causeway would ever have been needed in this area. Whatever Céis may mean, it seems that the name originally applied to the hill. Corran is a barony and ultimately the name of a people called the Coraind who inhabited this region. They are probably the Coriondi recorded on Ptolemy's map of Ireland. In the mountain are seventeen small caves in which were found the remains of animals such as reindeer, Irish elk, cave bear and arctic lemming, as well as traces of ancient human occupation. Keshcorran figures in the literary legends of Cormac mac Airt and of Diarmait and Gráinne. (One cave in the W. escarpment is Umhaigh Chormaic mhac Airt, Cormac mac Airt's Cave, for here the she-wolf reared him. ¾ m. N. of this, in Cross, is Tobar Chormaic, Cormac's Well, where Cormac's mother delayed his birth, as witness a stone with the imprint of the infant's head.) 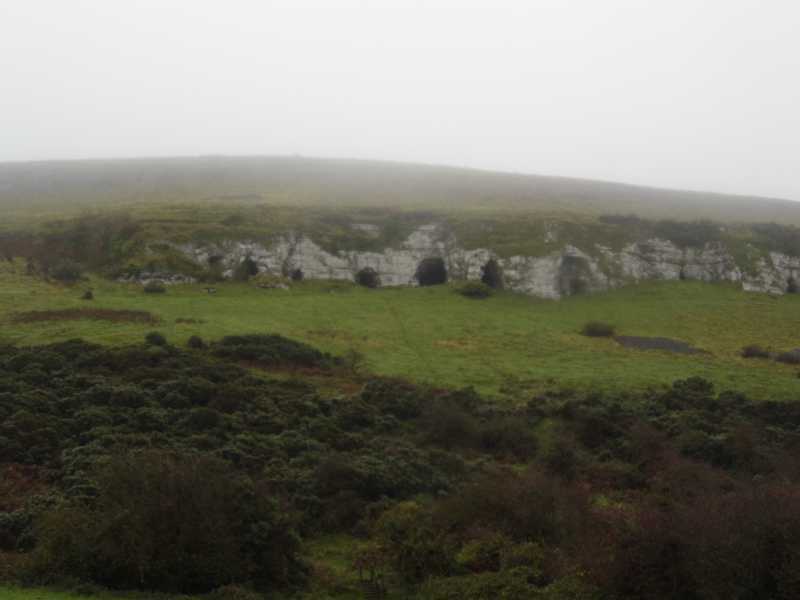 The greatest of Co. Sligo's Lughnasa celebrations was held on Garland Sunday in front of the caves of the W. escarpment [Shell Guide to Ireland]. Keshcorran is the highest hill in the Bricklieve/Curlew area and the 1034th highest in Ireland. Keshcorran is the most northerly summit in the Bricklieve/Curlew area and also the most westerly.